My sugar coated life...: Anyone for a brownie? I'm helping a friend out tomorrow on her closing down stall sale for Crib Designs. I decided we'd need some fuel to get us through the day and what better to refuel with than good old chocolate brownies. Double chocolate brownies actually. I have used this recipe for a while now, it's based on a recipe I found online but I have tweaked it over time and it makes some lovely moist chocolatey brownies for the most chocoholic-chocolate addict. 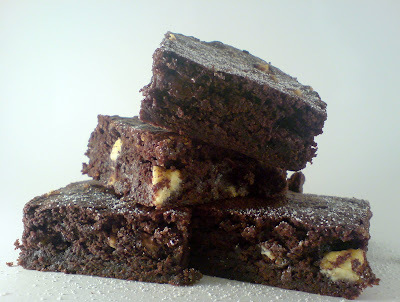 It doesn't make a traditional crispy crust brownie but a more dense cakey textured treat. 2. Grease or line bottom of an 8" square pan with greaseproof paper. 3. In a bowl, combine melted butter and cocoa. Stir well. 4. Add granulated sugar and mix well until fully combined. 6. Stir in vanilla extract, flour and salt. Try not to overmix. 7. Stir in chocolate chunks and put mixture into pan. 8. Bake in pan for 25 minutes, the brownies are done when the toothick comes out with slight crumbs. 9. Cool completely in pan before removing to cut into squares.